I’m not a natural runner, but I used to run every week, without fail, round the streets where I live. And I have to say I didn’t enjoy it much. The only things that kept me going were 1. knowing I would feel good about it afterwards and 2. Looking at all the houses as I ran past (I’d always make sure my route was down the streets with the nice houses!) Well, now I’ve given up running, (I decided life’s too short to do something you don’t enjoy and I get to walk to and from school twice a day now). 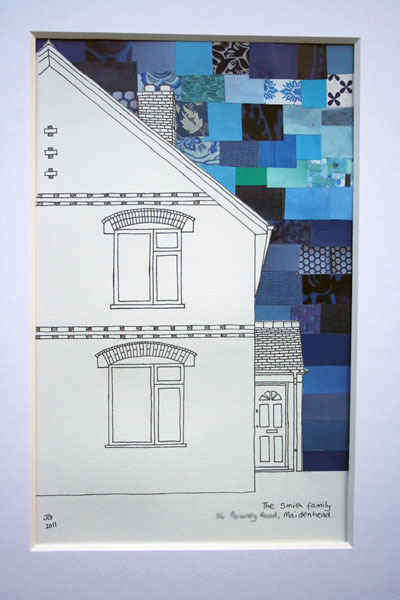 But I still get to look at lovely houses, and in even more detail as I draw personalised house pictures for people. Not only that, I love doing it, I really do. Here are some of my latest ones. 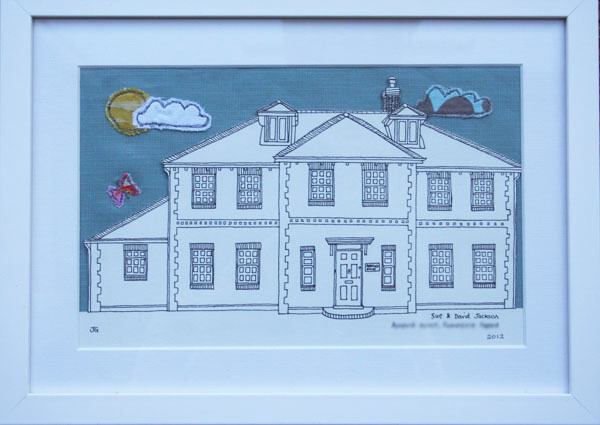 Firstly, a gorgeous house with lots of windows, with my embroidered sky (including a pretty pink butterfly), in a white frame. This was for a lady who wanted to give it to a friend as a thank you gift.